Posted by You pronounce this noodle like a coybow.. Yeeeeeee! Its spelled a variety of ways: Yee mein, Yi mein, e-fu noodles, yee-fu noodles, yi noodles, or yifu noodles. They represent longevity and so are often served during traditional Chinese birthday celebrations, or as one of the last courses of a multi course Chinese wedding meal. You can find these slighty springy noodles that absorb sauce amazingly (and still stay soft and intact) initially as a nondescript pale poofy "cake-like" round of dried noodles in the refrigerated section of most Chinese grocery stores. 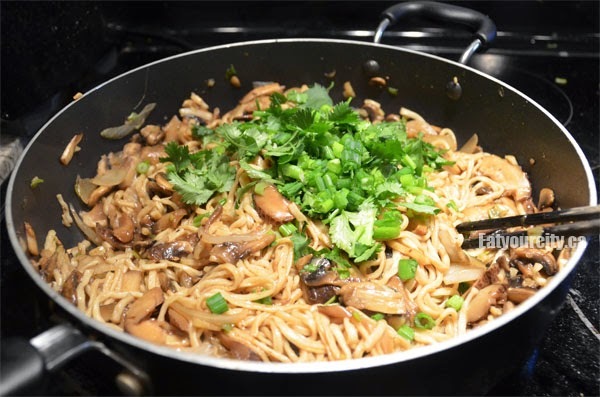 Then you braise it in a rich oyster sauce with savory earthy Chinese black mushrooms and either chives or green onions for an unami savory bowl of noodles you'll crave again and again. Dried shitake mushrooms are dried to concentrate its unami flavors and deepen its characteristic mushroom flavor. Colours range from a deep black, to ashen grey as well as various shades of brown. Avoid ones that look moist (more susceptible to mold or mildew), have tiny bumps on the stem or underside (sign of insects), or ones that smell odd (dank, sour, rank) as your dried Chinese mushrooms will only taste as good as the quality of them... that's why they range in price... but its always best to look for clean, dry shitake mushrooms that have a flower cracking pattern on the mushroom surface with a rich mushroom aroma when you take a sniff. 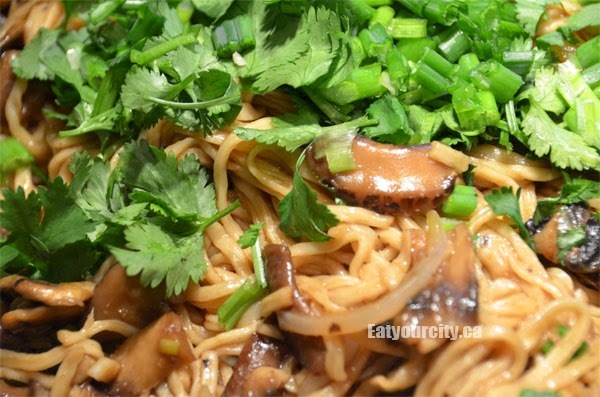 You can add in sauteed chives, bamboo shoots, bean sprouts, straw mushrooms, enoki mushrooms, or whatever you desire. Some Chinese restaurants serve this noodle as a base for freshly cooked crab. Mmmm! I used a deep frying pan, but you can easily do this in a nice wok as well. -5-6 medium sized Chinese dried shitake mushrooms, rehydrated, reserve soaking liquid. 1) In a large pot of boiling water, immerse the yee mein noodle cake and with chopsticks or tongs, swirl it in the hot water and cook for 3 minutes to rehydrate the noodle. Drain well and set noodles aside. 2) In a large wok or deep frying pan over medium high heat, add 1 table spoon canola or peanut oil, garlic and ginger and let them infuse the oil for about a minute or two. Add in the sliced rehydrated shitake mushrooms, let cook for a minute or two. 3) Add in remaining vegetables: mushrooms, onions and chives if using. Cook for 3-5 minuts more until the onions are translucent. Pour reserved mushroom soaking liquid into a measuring cup and add chicken broth to make up 1.5 cups of liquid. Add this liquid to the pan as well as the oyster sauce. 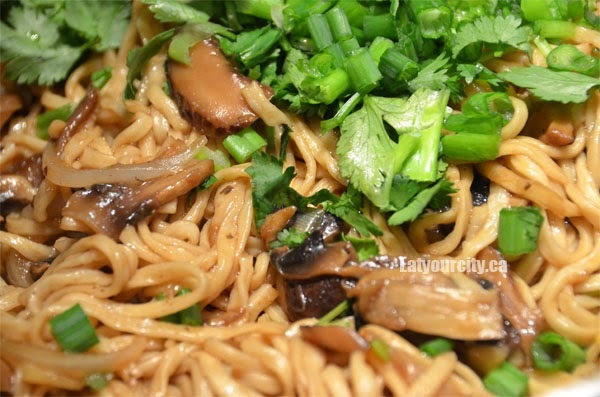 4) Add in drained noodles, mix well - the noodles will soak up the sauce pretty fast. When most of the sauce has been absorbed, remove pan/wok from heat and drizzle with sesame oil (flavor disappears if you heat it too long so always add it last) and green onions/cilantro. Dig in!